Wednesday led some prominent Muslims in the country to the Presidential Villa, Abuja to protest what they called their marginalisation. At a closed-door meeting with President Goodluck Jonathan, Vice -President Namadi Sambo and a few top government officials, the Sultan and the other muslim leaders specifically faulted the composition of the national conference , saying it was skewed against them. Their protest took place just as the delegates to the conference again failed on Wednesday to agree on what constituted a majority in taking decisions on issues. The Secretary-General of the Nigerian Supreme Council for Islamic Affairs Prof. Ishaq Oloyede, disclosed to State House correspondents that the Sultan and his team made their grievances known when they met with Jonathan for about an hour in the Presidential Villa, Abuja. Oloyede however said the President assured the delegation that his administration was committed to being fair to all Nigerians irrespective of their religion or tribe. He said that Jonathan asked members of the delegation to convey his message to all Muslims in the country that even if there were issues not taken care of , they were not done deliberately. Oloyede said while they would believe the President, members of the delegation also held the belief that it was proper for them to protest to Jonathan. He said, “We came to discuss with the President and we are happy we consulted him, and he has given us reasons to re-assure Muslims that they are not deliberately marginalised and he has asked us to convey the feelings of the government, the genuineness of the government and the fairness of the government to the entire populace. “He said that if there were issues that were not as they ought to be, they were not definitely deliberate and we want to believe that Mr. President told us his mind; but we also want to believe that it is proper to protest, it is also proper to assume that a leader will always be just even if there are mistakes thereafter. When asked to be specific on some of the feelings the Muslims conveyed to the President, Oloyede mentioned the composition of the ongoing national conference. “May be because you are not a muslim, if you were one, you would know the feelings of the Muslims presently about the composition of the National Conference,” he concluded. The Sultan declined to speak with journalists at the end of the meeting. Those who accompanied him included the Shehu of Borno, Alhaji Abubakar Ibn-Garbai; a former Chief Justice of Nigeria, Lawal Uwais; and a former Head of Service of the Federation, Alhaji Yayale Ahmed. It will be recalled that JNI, the apex body for Islamic organisations in the North, had recently accused Jonathan of having a hidden agenda with the convocation of the National Conference. 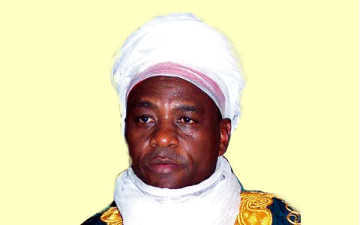 The Sultan –led JNI had regretted that despite the concerns expressed by well-meaning Nigerians, the President had gone ahead to inaugurate the conference. It also said that Muslims were short-changed in the selection of delegates to the conference. He said the process of selecting delegates to the conference negated the spirit of democracy as majority of delegates to the conference were Christians. According to him, 62 per cent of the delegates to the conference are Christians while the remaining percentage is shared by Muslims and other religions in the land. The Secretary-General said that of specific concern to the JNI was the representation of the security experts in the conference, noting that out of the 18 experts, only 22.2 per cent were Muslims. He said, “What is most disturbing is that the Muslim leadership and Islamic groups have called the attention of the President to this matter but he has paid no attention to it. “Let me comment on the conference, which the Federal Government has convened. It is on record that many Nigerians, including the leadership of the muslim community in the country, have expressed various concerns regarding it. Nigerians have warned that the conference is ill-timed given that electioneering is about to begin. Even with all these cries, the conveners have gone ahead to host the conference. “We are however worried that the process of selecting participants to the conference has been observed to have thrown away all known dictates of fair representation in a democracy, which will no doubt affect the credibility of the outcome of the conference. Although, democracy is a game of number, this has not been respected. Meanwhile, delegates to the conference have again failed to agree on what constitutes a majority in decision making. The division between the North and the South further caused uncertainty as a meeting called by the NC Chairman, Justice Idris Kutigi (retd. ), with 50 leaders from the six geo-political zones was adjourned till Monday. While delegates from the North asked for retention of three-quarter majority, those from the South wanted two-third majority in the absence of consensus. Signs that proceedings might not be smooth emerged when the Lamido of Adamawa, Dr. Muhammadu Mustapha, threatened to lead his people out of the conference. Mustapha , who told the conference that his kingdom extended to Cameroon, said he still had his people there that would receive him and his kingdom if they seceded from Nigeria. The Lamido was referring to the three-quarter majority contained in the conference rules. The conference, however, agreed to invite memoranda from the public to accommodate people’s views in the discussion. It has a deadline of two weeks to receive the memoranda while other business of the conference would continue. Kutigi had earlier before the plenary met with leaders of delegates across geo-political zones till the early hours of Wednesday. Delegates from the South-West, South-South and South -East also met at the residence of an Ijaw leader, Chief Edwin Clark, till arround 2am on Wednesday. The PUNCH learnt that the meeting focused on the three-quarter majority stated in the rules of proceedings. At the resumed session on Wednesday, the Vice-Chairman of the conference, Prof. Bolaji Akinyemi, announced names of 50 selected delegates that were to meet with Kutigi for further consultation on the majority vote. On resumption, Kutigi again adjourned the conference till Monday to allow further consultations. He said no decision had been reached at the meeting.